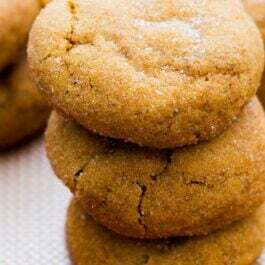 Here is my reader favorite recipe for soft and thick snickerdoodles. These soft-baked snickerdoodle cookies only require about 30 minutes start to finish! How do you make snickerdoodles puffy and soft? The secret’s in the ratio of butter to leavener to flour to egg. Don’t use shortening here; you’ll miss the flavor of butter. Slightly under-baking the snickerdoodles also guarantees a softer cookie. Take them out of the oven after about 10-11 minutes. This will keep the interior of the cookie soft and chewy. These snickerdoodle cookies aced the true “soft test” meaning they remained soft on day 2! In fact, they were still soft on day 4. (And I’m surprised there are any leftover by that point, but I was trying to make a point!) 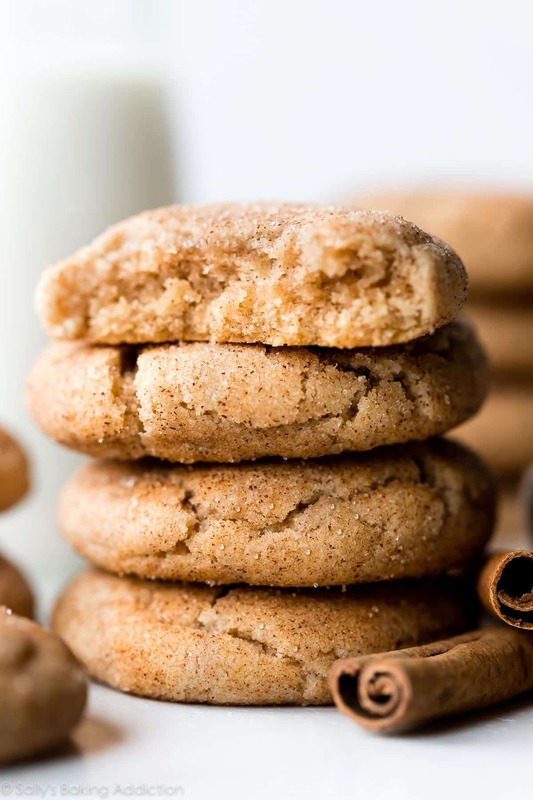 Since they remain so soft, snickerdoodles are the perfect cookie for gift-giving. 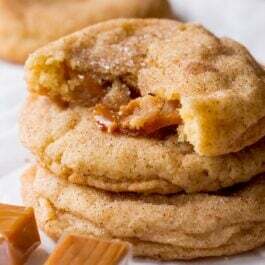 I know there are many snickerdoodle lovers out there! Why is Cream of Tartar in Snickerdoodles? Instead of baking powder, use cream of tartar and baking soda in snickerdoodles. Sure, you could use 2 teaspoons of baking powder instead of the cream of tartar + baking soda, but then you won’t really have a snickerdoodle. 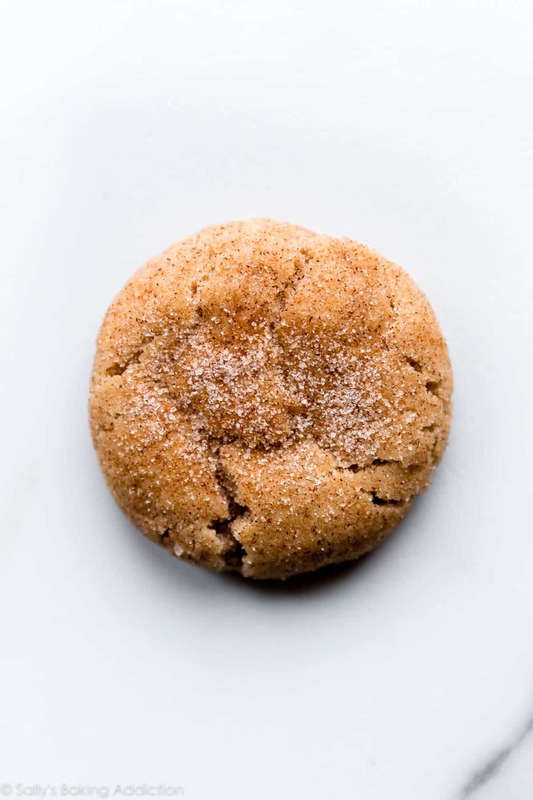 Cream of tartar adds a unique tangy flavor to the cookie, which sets it apart from sugar cookies and makes it a classic snickerdoodle. It’s absolutely delicious! Great news! 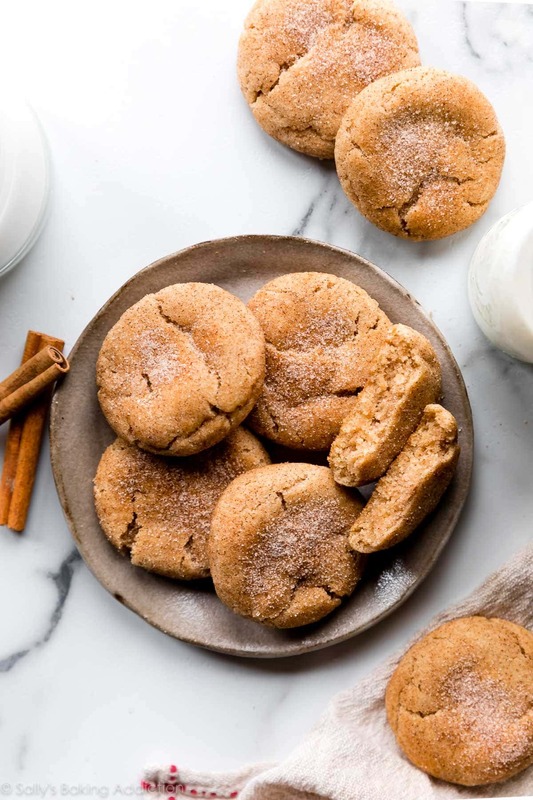 You can skip the cookie dough chilling step with this snickerdoodle recipe. 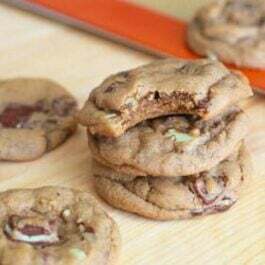 There’s enough flour in this cookie dough to create a strong and sturdy cookie without the crutch of chilling the dough first. There’s also no fancy-pants ingredients required. These snickerdoodles are EASY. Here is my reader favorite recipe for soft and thick snickerdoodles. 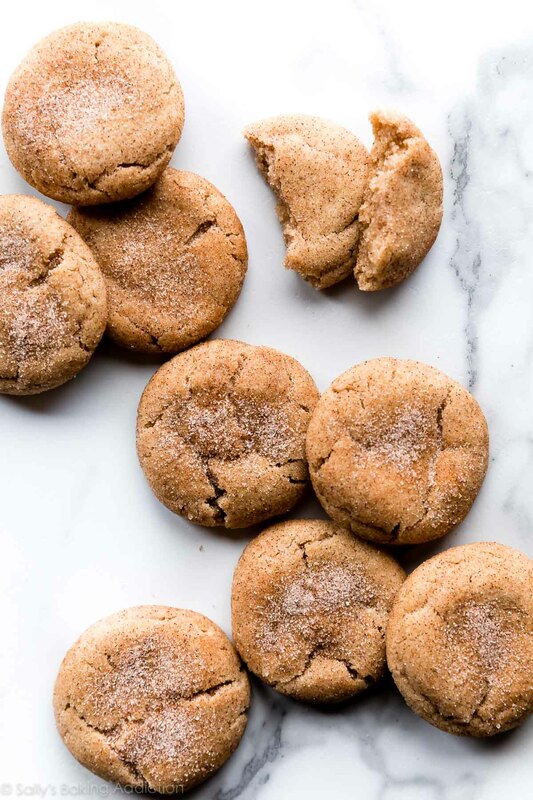 These soft-baked snickerdoodle cookies only require about 30 minutes start to finish! No dough chilling required. Preheat oven to 375°F (190°C). Line two large cookie sheets with parchment paper or silicone baking mats (always recommended for cookies). Set aside. Make the topping: Combine the granulated sugar and cinnamon together in a small bowl. Make the cookies: Whisk together the flour, cream of tartar, baking soda, cinnamon, and salt together in a medium bowl. In a large bowl using a hand mixer or stand mixer fitted with a paddle attachment, beat the butter and granulated sugar together on high speed until smooth and creamy, about 2 minutes. Add the egg and vanilla extract. Beat on medium-high speed until combined. Scrape down the sides and up the bottom of the bowl with a rubber spatula as needed. With the mixer running on low speed, slowly add the dry ingredients to the wet ingredients in 3 different parts. The dough will be thick. Roll cookie dough into balls, about 1.5 Tablespoons of cookie dough each. I recommend this cookie scoop. Roll the dough balls in cinnamon-sugar topping. Sprinkle extra cinnamon-sugar on top if desired. Arrange 3 inches apart on the baking sheets. Bake cookies for 10 minutes. The cookies will be very puffy and soft. When they are still very warm, lightly press down on them with the back of a spoon or fork to help flatten them out. Allow cookies to cool on the baking sheet for 10 minutes and transfer to a wire rack to cool completely. Cookies remain soft & fresh for 7 days in an airtight container at room temperature. Make ahead tip: There are a few options here! First, you can prepare the cookie dough and chill it in the refrigerator for up to 3 days. Make sure that you let it come to room temperature before rolling and baking the cookies. You can also freeze the cookie dough balls. Roll the dough into balls then freeze the balls for up to 2-3 months. You can freeze the cookie dough balls with the cinnamon sugar coating or without, but I recommend freezing without the topping. When you are ready to bake, remove the balls from the freezer, let sit for 30 minutes, pre-heat the oven, then roll into topping. You can also freeze the baked cookies for up to 3 months. Thaw overnight in the refrigerator before serving. Cream of tartar is required for this recipe. Please see the text of the post for more information.